Asbestos is a mineral that came into wide use between the ‘50s and ‘80s in many construction projects. In particular, asbestos was favoured for possessing several great qualities including rigidity and fire resistance. During that period, the mineral was used in the construction of heating flues, bath panels, floor tiles, garage roofs, sheds, gutters and wall and ceiling linings. But during the ‘70s, scientists discovered that prolonged exposure to asbestos produced adverse effects including cancer and respiratory ailments. While asbestos can be readily found in a vast array of environments, prolonged exposure to high quantities increased the risk for these diseases. Unfortunately, the adverse effects can only be seen between 20 to 30 years after exposure, when a disease has already wreaked havoc on a person's body. In response to this, the mineral has been banned for use in construction projects, particularly in residential properties. If you fear that your home has been built with materials using this mineral, you might be seriously considering asbestos removal. Perth homeowners, however, ought to know that the removal of the mineral is not the first best option in every case. For example, if your home was built during the ‘80s or a few years later, it is highly likely that the building materials used in the construction of your residence do not contain asbestos. However, if your home was constructed before this period, there is a significant chance that there may be asbestos there. Another important thing to note is that when left untouched or undisturbed, asbestos does not pose a serious health risk to the residents of a household. On the contrary, asbestos removal, when done incorrectly, can further increase the risks. If you are remodelling a portion of your home that has asbestos, the contractor can work around this material to ensure that it is not disturbed. Additionally, there are treatments available that can be applied to asbestos that will permanently bind the fibres together. However, if you do not wish to gamble on the health and wellbeing of your family, then your best choice would be to remove the material containing asbestos from your home. In this case, it is imperative to choose an expert with the knowledge, skill and equipment to perform the job correctly. A suitable contractor knows how to properly remove materials containing asbestos. Do mind that sawing, drilling or sanding materials with asbestos allow the harmful fibres to escape into the air. Experienced contractors also know how and where to properly dispose of the removed materials, thus preventing exposure and contamination to unknowing victims. About the author: Kenneth Lawrence is a “Handyman.” He is also a content creator who writes about home renovation, kitchen improvement, interior and exterior designing, DIY projects, landscaping and other related topics that can help improve houses. 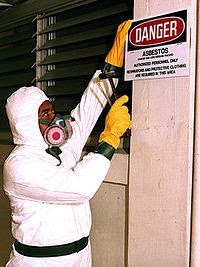 As of now, he visits www.martelletticontracting.com.au to know more about home services like asbestos removal. All asbestos-containing waste should be handled by a licensed asbestos contractor makes sure that all of their workers are highly-skilled and equipped with all of the important safety gear and equipment.